A beautifully designed gift book filled with enduring Scripture verses and uplifting traditional hymns, A Bountiful Harvest will sow seeds of joy and thanksgiving and result in a harvest of blessings. The compact volume is paperback bound with spot varnish and gold foil embellishments. Personalize a thoughtful gift with the presentation page in the front. 15 x 10cm. 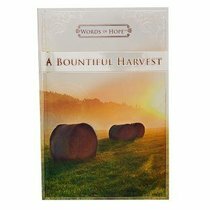 About "The Bountiful Harvest (Words Of Hope Series)"
:A beautifully designed gift book filled with enduring Scripture verses and uplifting traditional hymns. A Bountiful Harvest will sow seeds of joy and thanksgiving and result in a harvest of blessings. As we feel the power behind the well-loved hymn Amazing Grace, so can we feel comfort from the Scripture verses contained within this sweet book from the 'Words of Hope' Collection. Scripture is selected and grouped to complement each of the 7 stanzas of the hymn. The compact volume is paperback bound with spot varnish and gold foil embellishments. Personalize a thoughtful gift with the Presentation Page in the front. 10 x 15cm. We can gather so much comfort from the beloved poem Footprints. This fine book of Scripture verses, chosen to deliver that same sense of comfort and inspiration, is certain to become a favorite companion. There are 15 subjects to read from - including 'Doubt', 'Worry', 'Trial', 'Unfailing Love' and more. The compact, pretty volume is paperback bound with spot varnish and silver foil embellishments. Personalize a thoughtful gift with the Presentation Page in the front. 10 x 15cm. The Words Of Hope inspirational gift book series presents Scripture, prayers, and timeless words of wisdom and comfort in a range of elegantly designed softcover bindings. Ideal for daily quiet time, travel devotions, or a pick-me-up through the day. 10 x 15cm, 128 pages.